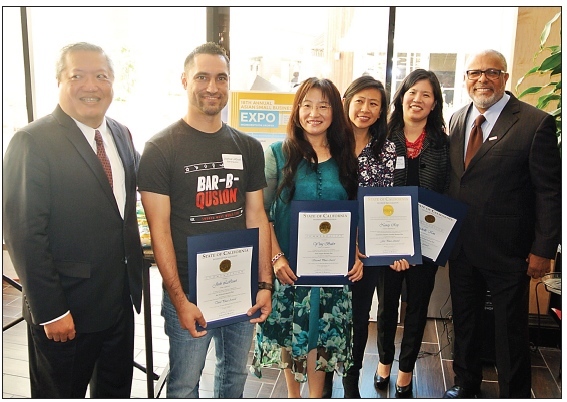 From left: Ron Fong, API SBP executive director; Joshua LaQuet, Bar-B-Qusion (third place, business plan competition); Ying Butler, YZY Global LLC (second place, business plan competition); Nancy Ray and Michelle Kim, Clementines Mandarin Preschool (first place, business plan competition); Darrell Brown, senior vice president and Greater L.A. coastal region manager, U.S. Bank. The 18th annual Asian Small Business Expo, presented by the Asian Pacific Islander Small Business Program (API SBP) with U.S. Bank as Title Sponsor, will be held on Saturday, Oct. 14, from 9 a.m. to 1 p.m. at Alamansor Court Conference Center, 700 S. Almansor St. in Alhambra. “We are delighted to support Asian Pacific Islander small-business owners as they start or expand their companies. U.S. Bank has long been a trusted financial partner for entrepreneurs throughout the Los Angeles area, and we are excited to see the variety of businesses that will be involved in this competition,” said Darrell Brown, senior vice president and region manager for U.S. Bank in greater Los Angeles. Highlights of the event include networking, exhibitors, business services, government agencies, franchisors, start-up opportunities, and free workshops. Featured guest speaker will be Jonny Hwang, founder of 626 Night Market. Jerome Horton of the California Board of Equalization will be a special guest. Admission is free. For more information, visit www.apisbp.org/expo.html.